Luxury Waterfront Whitefish Vacation Rental Seconds from Whitefish City Beach and Downtown! Enter your Dates and CLICK "GET QUOTE" to Book Today!!! This is a brand new Whitefish river development with four luxury condos. 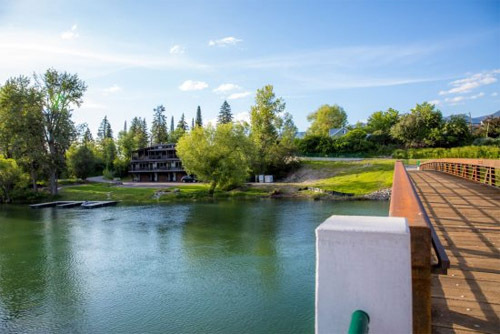 It is located directly on the river and is just a 1 minute walk to Whitefish Lake City Beach. Follow the walking trail from The Landing and you'll be in downtown Whitefish in about 10 minutes. The location and setting of The Landing could not be better. The common area gently slopes toward the river bank with over 135 feet of whitefish river frontage. At night, kick back and enjoy the 2 huge fire pits with family and friends. 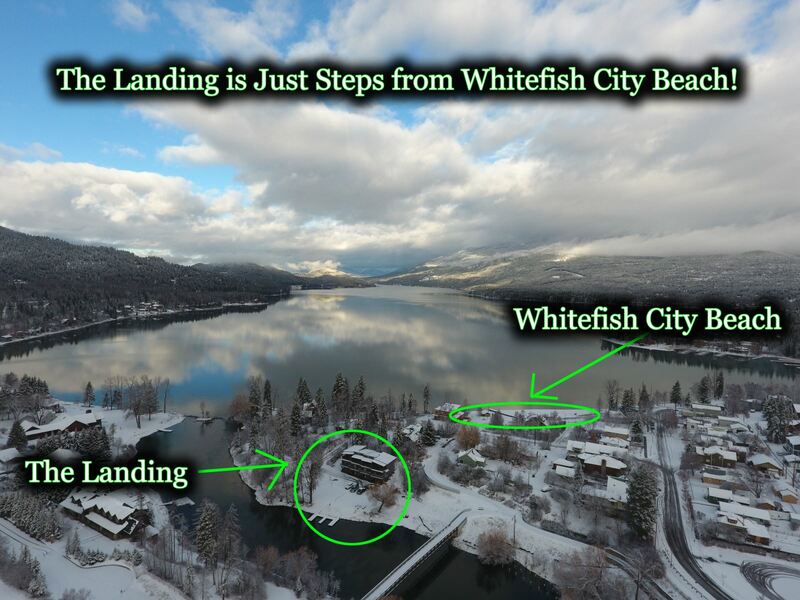 The Landing is only a 10 minute drive to Whitefish Mountain Resort where you'll enjoy world class skiing and hiking. No matter the season, The Landing is the perfect location for your Montana vacation. Enter from the first-floor foyer and in the lower level, you will find a bunk bed that is adult sized longer with premium mattresses for comfort that sleeps two. This level also has a half bath and laundry room. This condo comes with an oversized 1 car garage. Take the stairway up to the fantastic second level for entertaining. The second level contains the great room, dining room, kitchen, grilling deck, master bedroom with an en-suite bathroom, and a half bath for the living area. GE Monogram Chef's kitchen for gatherings and entertaining. Our kitchens come fully stocked with all the tools and appliances needed for a fabulous stay. A new stainless grill is located on the balcony right off the living area so it is easy to take food back and forth from the kitchen to the grilling area. Reclaimed wood Dining table seats 4 and the bar/island seats 4. Enjoy sitting around the fireplace with the floor to ceiling stacked stone. The living room comes with a very comfortable sofa and two leather chairs for sitting back to read or to watch your favorite movie. Upstairs you'll find two large bedrooms with Queen beds. The bedrooms share a full bath. The upper level also contains a bunk bed that sleeps an additional 2 people. The bunk beds are adult sized longer with premium mattresses for comfort. Access the large riverfront balcony from the upper level. The river views from the balcony are breathtaking and you can enjoy them while sitting in your personal hot tub! Sleeps 10 in beds and the max we allow is 10 people. Approximately 2,000 heated and cooled square feet with another 400 feet of riverfront balcony space. As great as the condos are the real fun is the outside. You have 2 fire pits on the property with wood supply provided for roasting marshmallows and enjoying the simple fun of a group campfire. There is also a horseshoe pit for playing a serious or just a fun game of Horseshoes! 4 slip dock. The river is not deep enough for motorized watercrafts but you can enjoy cruising the river and head to the lake in a kayak, canoe or on a standup paddleboard. For more fun outdoors you are just steps away from the famous Whitefish City Beach which is an awesome public beach open in the summers with beautiful white sand. Plenty of room to layout and to bring lounge chairs for sunbathing. Swimming area for kids, water sports rentals, grill with all the food and ice cream you can stand.